This is my third in a series seeking to express the experience of Ménière's. I wished to covey something of the sense of the mental isolation produced by a chronic swirling of the visual field, the sense of the ears being a locus of malady, the sense with Ménière's that one is falling into a state of mental dissolution. 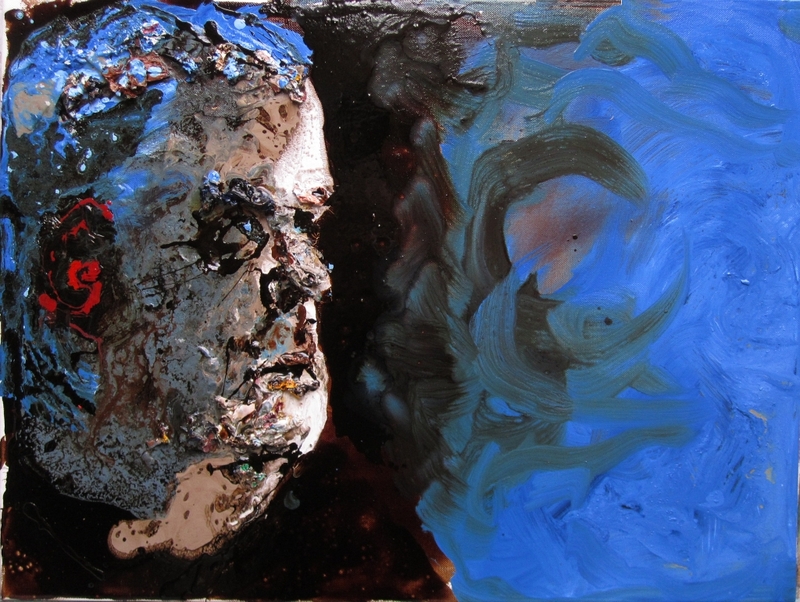 Primarily, however, this work is a practical investigation into some current art theory relating to expressive mark-making in portrait painting (my Masters degree project). It is an exercise in agency of media, an aspect of what is called ‘material thinking’ in creative practice. 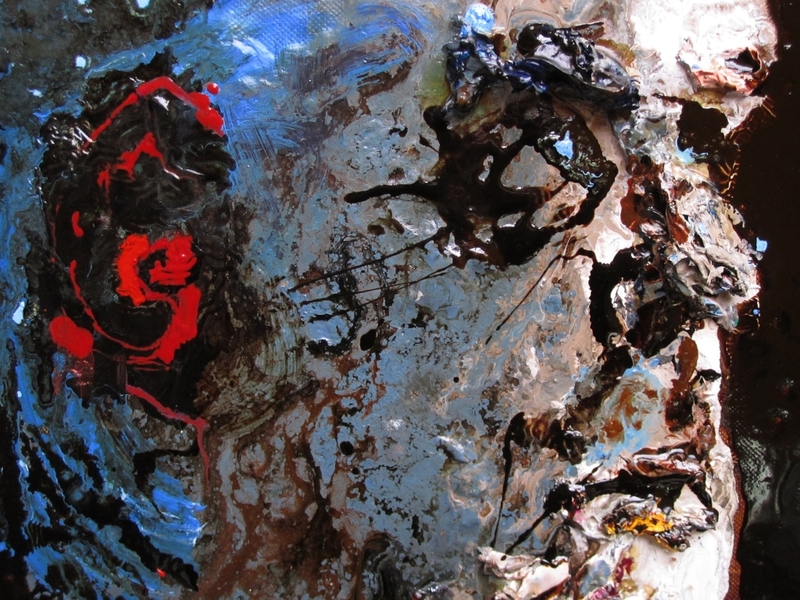 Material thinking, as opposed to instrumental thinking, turns the painting process on its head to some degree. Instead of starting out with a preconceived image in mind and then getting to work with brushes and paint, bending them to your purpose through a series of learnt painterly skills (‘tricks of the trade’), one starts out with a set of materials and tools, media and supports, that are at hand. Already at this point one is open as to what those materials might be. In the case of Ménière’s III one of those materials was a very old tin of walnut stain varnish that had evaporated to the consistency of honey beneath a thick leathery skin. I cut through the skin and poured the treacle varnish onto a new canvas support and proceeded to spread it like icing on a cake with a large spatula, but allowing a thick pool to form toward the left-hand side of the frame. Into this pool i then poured oil paints much thinned with painting medium. I poured them roughly where i judged the proportions of my facial features might lie. I hardly disturbed the combined paints and instead observed over the period of an hour that convection currents had set up within the paint-pool that of themselves created swirls and textures on the 'face'. I embedded some dried out oil paint scrapings from the palettes of previous work that i had kept (waste not, want not) and consequently happened to have at hand. Finally i drizzled on some more of the varnish, Pollok-style, to suggest features like eyes, mouth and ears. To Heidegger this ‘at hand’ aspect is of philosophical significance. “At hand’ is actually how we live our lives. We go to a school ‘at hand’. We eat foods ‘at hand’. We marry someone ‘at hand’. We get buried in plot ‘at hand’. So when we paint with media we find at hand we are engaging in the same exploratory open-ended processes that we use in daily living. And just as in life we are never really able to absolutely predict the outcomes of our choices and actions, so there is an indeterminacy when we use what happens to be at hand in our creative practice. In Material Thinking and the Agency of Matter she writes of a "focus on the acting ensemble rather than the artist as the locus of art enables us to come closer to an understanding of the dynamism of material practice and to the radicality offered by the notion of material thinking. In this dynamism, the outcome cannot be known in advance. Thus although we may have some awareness of the potential of a tool or a piece of wood—for example, through previous dealings with wood and tools—every new situation brings about a different constellation of forces and speeds. The wood may be a bit harder, the tool sharper or blunter and our own energies more or less focussed. Thus our relation to technical things is inevitably characterized by a play between the understandings that we bring to the situation and the intelligence of our tools and materials. This relation is not a relation of mastery but one of co-emergence" (p. 3). “Letting art emerge” – what a mind-expanding way of looking at the act of painting. We do not paint by numbers, colouring in tight drawings to produce exact likeness in a controlled way. Rather, we set up situations where watercolours or oils can behave the way they naturally do, with capillary action, with granulation and flocculation, with plastic flow under gravity, with oozing, with buttery resistance. Painting becomes haptic play that relies on the synchronous serendipity of media as one nudges and seduces it into place in a quest to realise one’s inner purposing and the paint’s potentiality or potency. In Heidegger, handlability and praxical knowledge Barbara Bolt elucidates on these materials centred processes: “The focus on artworks, rather than practice, has produced a gap in our understanding of the work of art as process. ... By focusing on enunciative practices, that is, the systems of fabrication rather than systems of signification, I argue that there is a possibility of opening up the field of an “art of practice” from the bottom up, rather than from the top down. According to such thinking, such logic of practice follows on from practice rather than prescribing it ... Here artistic practice involves a particular responsiveness to, or conjunction with, other contributing elements that make up the art ensemble. What is critical to creative practice is the type of insight that emerges through this handling. In artist tool matrix, engagement with tools and technology produces its own kind of sight”. She concludes her train of thought with the startling proposition that “The work of art is not the artwork”. “ What is seen on the surface is simply how the paint has responded to a set of controls or to the exigencies of a system. Remaining true to this mandate means I often feel the system pushing up against my own subjectivity, my sense of the way things should be. At times my response to the material would be to refine the surface, firm up the edges, control the bleeds. The mandate is meant to form a collaborative engagement between system and material, an approach that suppresses the deliberate role of the artist in terms of both expressive intentionality, aesthetic and editorial concerns. Once a system is developed and set in motion there is no editing or rejection. The image gels into its final state with no subsequent authorial intervention. What emerges is what is presented.” (p. 20). So where does all this leave portraiture as the depiction of the ‘likeness’ of a sitter? Taking up brush and paint in order to produce a recognizable semblance of the physical appearance of another person (a likeness) is instrumentalist thinking. But once painting becomes process focused rather than product focused and paint is given agency, then inevitably the resulting image will evidence a reduction in the very cognitive control over brush and paint that is required for realism. One hopes that in place of physical likeness the work will realize a psychological likeness to the subject. Or if not the sitter, become a psychological reflection of the painter. “Every painter paints himself”, as the Renaissance had it. Though if there is no likeness of any kind to a particular sitter then i guess the artist has moved from ‘portraiture’ to ‘abstract figurative painting’. Though i am now left questioning just how central 'likeness' is to portrait painting. To imitationalists it is the very purpose of painting and the measure of its success. To instrumentalists such as social realists it is often a necessary vehicle to their purposes. To formalists too it has generally been assumed to be the goal of managing visual elements, though exploration of formal elements lead to stylization and, ultimately, to abstraction. To expressionists (i count myself as a quasi-neo-expressionist) likeness often remains an intention but not at the expense of emotional impact. Likeness now takes second place. But what happens when likeness takes sixth place after emotional impact, catharsis, rhetoric, cross-cultural exploration, stylistic innovation, and agency of materials? Thankfully the institutionalists will work it out. So here it is, an open-ended excursion into material thinking, into co-responsibility and partnership with media in creative praxis, into the agency of paint and the gifts that it brings, an interrogation of interpersonal perceptual processes and the question of ‘likeness’ in portraiture - Ménière's III. I applaud you for your strength and your clarity! I am not a man of words, but I appreciate the depth of your experience and exploration. Your work always makes me sit up and take notice, and I can just imagine the man behind it. I get it and can hardly express my joy that you are taking this class. I love learning, especially such interesting new ways of looking at things. And may I say that your effort at working in this way produced an excellent example of the idea. I've re-worked the portrait I did of you, trying to better express my idea of what Meniere's must be like. I haven't posted it, however, as I'm not convinced I've hit the mark. Maybe I'll try this new method and see what happens! Thanks for the great explanation and I hope the Meniere's rapidly fades to little more than a memory. Oh, Harry, so much to ponder...and no words better than those already presented here, but I can say, that as a woman of words, and one acquainted with vertigo, it is the right side of M-III that most appealed to me...and I do mean appeal, for it reached out to me, waving across a distance, familiar and urgent. Thanks, Harry, for this portrait and the description of how you worked with the materials at hand to create it - and this very interesting and thought-provoking post. I'm going to print it out and read it again (I get so much more out of something that's read while paper is in hand, not words on a computer screen). As for the portrait? Well, for me it was a disturbing portrait and also an uplifting one - why? The blue glint in the eye that's looking upwards, not down = hopeful, searching, still very much alive and kicking!! You're such a nice guy, Brian. Always so positive and encouraging. It's given me a real thrill to watch your work and reputation grow humongously over the last couple of months. Cheers, buddy. Hi Gary. The good wishes must be working because i am indeed feeling better. Thanks for the positive response to my experimentation though i must admit that the painting is remains quite representational and didn't allow the paint the free reign i might have done. It's too scary and i chicken out. Biggest worry is the everyone else will simply think my work is the forensic remains had an industrial accident. Hey, that's given me an idea! A new style!! Industrial toxic neo-punk!!!! Harry, j'aime l'utilisation de la matière et l'expressivité. On some level, I understand this process although I'd never be able to describe it--I think it occurred more often when I was sculpting. This is an amazing portrait, whatever method you used. (I have many cans of stain that should have been discarded years ago--I'll keep them at hand.) "The work of art is not the artwork"--I agree. It's the doing. Thanks for waving back across a distance, Gabriella. Boston is so far away from Tasmania. I enjoyed my couple of weeks in Boston some years back (being an iconoclast from way back i particularly enjoyed discovering that the Puritan churches of Boston were built on money made from the rum and slave trades). Interesting how you responded to the field of blue. I wanted a figure that was cut off, entrapped in an enshrouding syrupy darkness that extended its vortex into the 'wild blue yonder' but remained essentially cut off from the freedom blythly entering it, the way others so effortlessly can. I know of your childhood ear-aches and that you have bouts of vertigo, so it's especially appreciated that the swirling flield speaks to you. Take care. I'm trying to pop in the odd philosopher for you nowadys, Annette. I have a problem with Satre, mainly because of an old Zen mondo about the fleas on a hot griddle - the ones in the air are doing fine, the ones on the ground are doing it tough, sooner or later they all choose to jump. Tyranny of freedom or tyranny or frydom? But yes, you have the nub of the delemma - how much do i assert control? Is an image where there was no deliberate control even 'Art'? (an issue canvassed in my July archive 'collaborative abstract painting'). I don't know the answer. I will try an produce some works with ever lesser degrees of control and see. I imagine they will look progressively less and less like portraits as we understand them. Max Ernst wasn't too worried, so i might even try his frottage. But most likely some form of action painting. The results may be so bewildering i may not post them here. There are already enough bloggers who think i can't paint, lol. To liberate paints from their containers with an ulterior motive, hoping their chemistry and the laws of physics will somehow conspire with my conscious and unconscious states of mind, allowing an image to emerge that i and other viewers can find meaningful in some way(s). Then i'll retreat to realism, scared out of my wits, lol. I know what you mean about the blue eye, Rhonda. But here is the strange part - when i first dropped a big blob of blue i was intending to later work some brown around it. But them it largely submerged and drifted north in the currents of oil and varnish! I let it do what it wanted, holding myself in check so as not to impose my preconceptions. And this is what the agency of the paint and your reading gave us. Thanks for the optimism. It's rubbed off on me. What stranger wheels within wheels! Merci, Olivia. Votre belles aquarelles montrent si bien l'agence de peintures que j'ai exploré ici avec cette peinture. The tins of stain sound promising, Hallie. But i can't see you going wild with them in that immaculate house of yours! Maybe save your anarchic impulses till Spring and let loose in the garden! In this painting your remind me of the power of Medusa to turn people to stone. You look like a victim of Medusa encased in a stone shell. If that's the sense of isolation you wished to convey, you have done it. a fantastic narrative to go with this powerful painting! Thanks for sharing your experience. I like the result of your work. You get a great painting-sculpture fusion based with textures and a metallic sheen really surprising. Congratulations on this great work. I completely agree, Davida. Since we are actually trying to communicate something with our art it can't simply consist of accidental paint spills. As you say, even the act of selecting constitutes an 'interference'. I'm not a surrealist advocating automatic painting. My experiments in paint flow and the use of non-conventional media is just that - experimental. It is not where i expect to end up as a mature artist. The expressiveness in my art needs to be my expressiveness, not the paint's. With this painting i exercised a lot of control over where the paint was poured, which colors, in what quantity and sequence. I was basically painting without a brush, but still painting in a fairly conventional sense. However, as you have discovered through your own experiments with watercolors, the paint does have its little ways and if we learn to understand those ways and partner with them, going with them instead of against them, the paint delivers many gifts. Those gifts aren't accidental either. They required our co-operation and wisdom in the ways of the paint/ink/charcoal/. This wisdom any watercolorist has, really. It's nothing special. But the attitude to honour the medium and let it have its own voice, its agency, is something special. Where each artist draws the line varies with each artist. I'm trying to discover where my line is. Ah, we are so lucky, you and i and all this virtual community of bloggy artists, to be on this journey and have the opportunity to share our discoveries and achievements. Thanks Willy for finding something of interest in my explorations. Hi Skizo, always nice to see you here. Thanks Celeste, though it's not the personal narrative i've largely been presenting to date - more of an academic rumination that will probably end up in my exegesis. G'day Lozzano. Wow that was some portrait you painted last time - the image still dances in my mind. Thanks for the kind comment. Thanks for finding something in my musings to merit linking to your philosophy blog, enowning. Your posts on Heidegger are most interesting. I like your work Harry. In many ways it has been the materials around us, that has defined our time and people, especially in the world of art. Hi Jet. Sorry i have nor replied earlier but i have only just now discovered your comment. And yes, i quite agree. We find ourselves in a place and a time and with that social and historical location comes a whole set materials that shape us and becomes the stuff of our art.